Timberland is able to manufacture its complete range of products in-house. Our large head office facility in Woodstock, Ontario, is ISO 9001 registered and fully equipped for fabrication and assembly processes. The production facility is located adjacent to Timberland sales, purchasing, engineering, project management and quality control to ensure the simplest, closest possible communications for the people involved in your project. Maintaining a single-source facility with engineering, manufacturing and support services under one roof reflects our commitment to ensure top quality and on-time delivery. 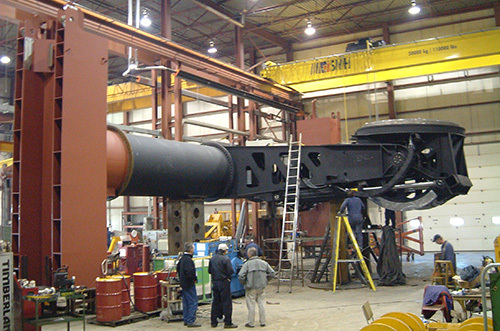 Any of the issues that typically arise in large custom manufacturing projects can be resolved immediately and effectively through direct one-to-one communication on the floor. Our commitment to quality is mirrored by Timberland’s long-standing discipline in ensuring job safety with no lost time. Visit our Projects portfolio for a closer look at Timberland’s manufacturing capabilities.